Uniform shall be clean, free from tears, Irish pennants, fading, etc. Hair is to be neatly brushed or combed. It shall not present ragged or extreme In appearance. Side burns must not exceed below the ear lobes. Goatees, beards, soul patches, etc. are prohibited. Nonprescription glasses are not to be worn. No jewelry is allow to be worn. Class A uniforms will only be worn for Academy Graduations unless told Otherwise. Shirt- Light Blue Class B button up shirt. A T-shirt that is the proper color. Boots- Black, shine-able, must be steel toe, and above the ankle. Watch- Digital watch worn on the left wrist. Every explorer will behave in a professional manner and must follow the required Chain of Command. 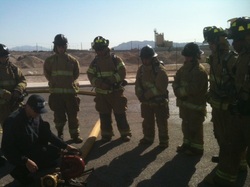 Explorers must conduct themselves in a professional manner hat is acceptable by the North Las Vegas Fire Department. If in any case, an explorer acts in an unprofessional manner disciplinary action may occur. Demerits or removal from the post may be the result. Attendance is essential for continued learning and training. The training program is designed as a scaffold, meaning that each week's lesson builds to the next level of understanding and skill set. Failure to attend causes gaps in the learning process. Explorers are required to report to the post no later the 6:00am on designated Sundays. Reminder- to be on time is to be late. The explorer is encouraged to arrive early. If unable to attend, the explorer is required to call their appropriate company officer prior to 6:00am. Time and commitment is required for the post. An explorer is allowed no more than two ins/absences per quarter of the fiscal year. Failure to call in will result in disciplinary action. More than two no-call/ no-shows in a fiscal year will result in a demotion.